When you meet Susan Vukich, you immediately notice the warmth in her eyes and her welcoming nature. As you spend more time with her, you realize you are in the presence of someone very special, someone who exudes inner strength and purpose. As you come to know her history, you realize that she and her daughter, Caroline Helm, have had a profound effect on thousands of people. 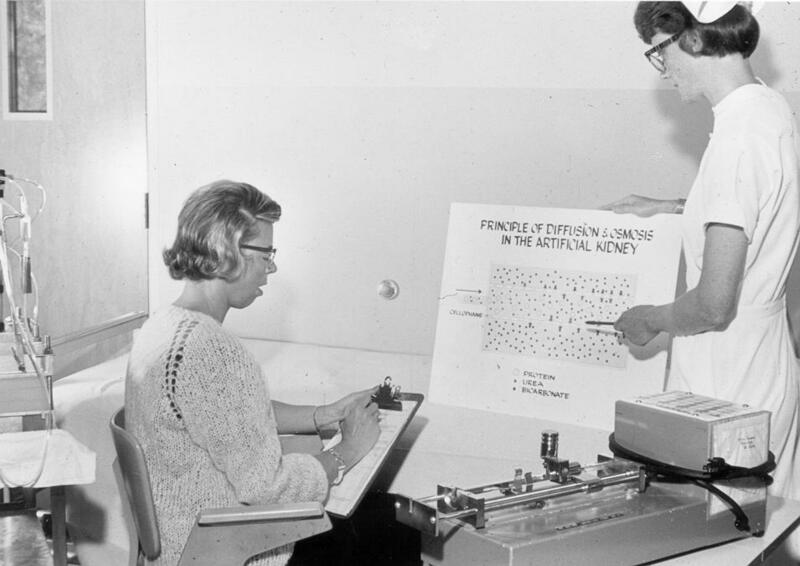 With support from her parents, Caroline willingly accepted the use of home dialysis in the early 1960s, helping establish this treatment method and paving the way for others living with end stage renal disease. Back then, dialysis was a scarce resource. To undergo treatment at the Seattle Artificial Kidney Center, patients had to be approved by members of a select panel. Choosing patients was difficult—for every available spot, there were at least five medically acceptable applicants. Among the applicants denied treatment at this time was Susan’s daughter, Caroline, who at age 16 was considered too young to be treated. Above: Susan getting trained on home therapy. Photo courtesy of Northwest Kidney Centers’ archives. Source unknown. Her doctor, the renowned Dr. Belding Scribner, was determined to help Caroline and thought that if she couldn’t dialyze at the center, she might be able to dialyze at home. Because no home technology existed at that time, Dr. Scribner enlisted the help of Dr. Albert Babb, a chemical biomedical engineer at University of Washington, to lead a development team. Working against the clock, as Caroline’s health declined, they developed a small, safe dialysis machine for home use in just four months. Caroline became one of the first home dialysis patients in the world. Although she appreciated the opportunity for treatment, being the first to do home dialysis had its challenges. Susan and Caroline faced many crisis moments in the converted laundry room that served as their home dialysis station. But in spite of her illness, Caroline embraced life to the fullest and became president of her high school honor society, attended the University of Washington, and enjoyed her friends, family and hobbies. She lived three additional years as a result of the treatment. Since then, thousands of lives have been saved with the technology she helped pioneer. 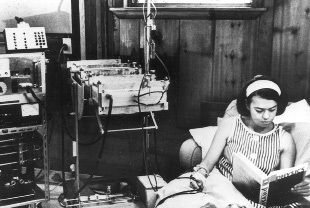 Caroline on dialysis at home. Photo courtesy of Northwest Kidney Centers’ archives. Source unknown. Susan Vukich remains grateful for those additional years of life Caroline enjoyed. That gratitude has inspired her to dedicate more than 45 years of caring and support for people living with kidney disease. She currently serves on the Board of Directors of Puget Sound Kidney Centers and remains a passionate advocate and supporter of patients and their families. Harold Kelly, President and CEO of Puget Sound Kidney Centers, describes Susan as a lioness, an indefatigable supporter of thousands of patients as they attempt to deal with life while living with kidney failure. We admire Susan for her compassion, tireless focus on quality, and strong desire to see the Puget Sound Kidney Centers and the nonprofit, community-based, model of health care and dialysis continue to thrive. Thank you, Susan and Caroline, for paving the way for home dialysis and creating a lasting legacy for our organization and kidney patients.